I don't know if it is finally or early but I started using 4K resolution camera after wishing to have it for a long time. The test shooting at Bon Dance at Kapaa Jodo was just amazing. Also I was surprised to know YouTube had a option to see this video at 4K resolution. However I saw some demerits....because of memory size of video, it's hard to edit smoothly with my slow pc and also it takes time to upload it to the youtube. 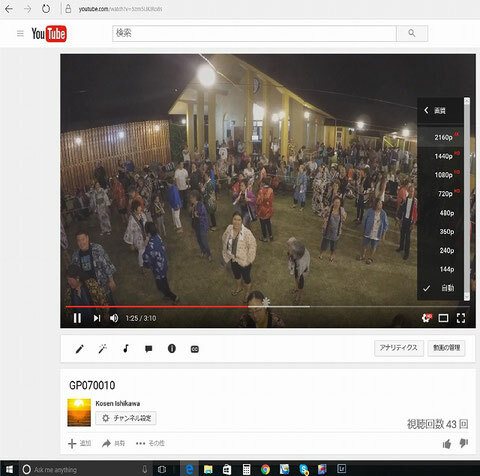 At Kapaa, it took almost all day long to finish uploading this video. One of the reasons why I film every Bon Dance every year is for the future. I want to capture this wonderful moment to pass it to the future.